With their combination of practicality, comfort and style, our garden deck chairs are a must have addition to your outdoor space. Featuring multiple reclining positions, our garden steamer chairs offer the height of comfort and relaxation. This garden teak steamer chair with cushion offers a superb combination of practicality and style, this poolside garden steamer chair has been expertly manufactured without compromise in sustainable, Grade-A teak, to ensure aesthetic appeal and long life. 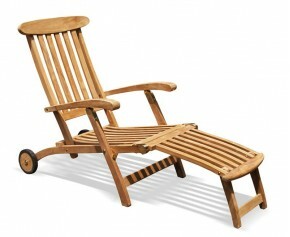 Sit back and relax in this beautifully crafted patio teak steamer chair with wheels. Offering a superb combination of practicality and style, this poolside garden steamer chair has been expertly manufactured without compromise in sustainable, Grade-A teak, to ensure aesthetic appeal and long life. This teak steamer chair offers a superb combination of practicality and style. This garden steamer chair has been expertly manufactured without compromise in sustainable, grade-A teak to ensure aesthetic appeal and long life. 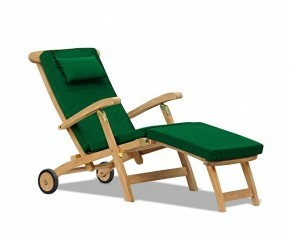 This teak steamer chair with wheels offers a superb combination of practicality and style. This garden steamer chair with wheels has been expertly manufactured to the highest spec from sustainable, grade-A teak to ensure durability and aesthetic appeal. All our garden sun chairs are made from the finest grade-A teak and are guaranteed extreme durability and longevity. Able to remain outdoors all year round for those days where the sun is not shining, our garden deck chairs require minimal maintenance and will provide you with fruitful use for years to come. We offer a wide selection of garden steamer chairs so you are sure to find one that caters to you unique taste. Why not add a cushion to our garden sun chairs for that extra added comfort? 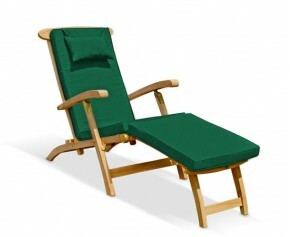 View our range of garden deck chairs here.